John White recently sent me an article from (I believe) the Cincinnati Journal of Commerce of December 10, 1867. It claims to quote an article from the Alta of November 7 which gave a description of the Central Pacific work completed to date, including a discussion of the Summit tunnel and other tunnels in the area. If someone has easy access to the Alta, I'd like to confirm the date of the article in that paper. The Cincinnati paper misleadingly titled the article "The California Pacific Railroad." It estimates completion to a junction with the Union Pacific in a year and a half – at Fort Bridger (the CP folks could wish it had gone that way). Jack also sent another, shorter article from the Cincinnati Journal of Commerce dated November 6, 1867, which quotes an undated issue of the Grass Valley Union. In addition to the Summit Tunnels, this article discusses the track laying from Coburn's Station (Truckee), with reportedly already 9 miles of track laid and an engine (one) and construction train at work. 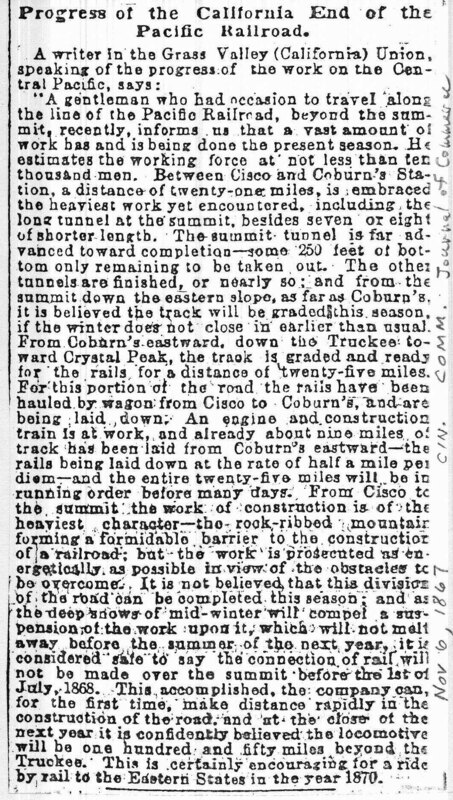 This article estimates that the Coburn's Station section will not be connected to the line through the Summit Tunnel until July 1868 because of snow, with eventual completion to the UP connection in 1870. He also sent another article from the Cincinnati Journal of Commerce of September 8, 1870 about a Chinese crew of 70 hired on a year-long contract to work in a large laundry in Belleville, New Jersey, north of Newark. Part of an attempt to introduce Chinese labor into the Eastern and Southern US. The Cincinnati article is in fact a reprint of the Alta Californian article from Nov. 10, 1867. They left off the last part of the article, which I attach here from the Alta Californian. Courtesy of John White and Kyle Wyatt. I seem to recall that the Alta [California newspaper] is available on microfilm at the [California State Library] California Room. You may possibly find the [Grass Valley] Union there as well. I can't believe I accidently found something old/new on California by reading through the Cincinnati papers but they and most other papers of the time copied articles from around the nation. The New York Times did a lot of this but tended to print only very condensed versions. Interesting what's out there if you just keep looking, but my old eyes are getting too weary to do much more microfilm reading. The Chinese article is not very politically correct but I found it interesting. The addition includes a brief piece on a brakeman who fell off a freight train (and lived); and also a longer piece about four white ruffians who robbed several Chinese. Eventually they tried the wrong group of Chinese – results one White killed, one injured, and all White survivors arrested. Nobody seems particularly upset by all this – the feeling in the article seeming to suggest that the Whites got their proper come-uppance. Two of the Whites were known naer-do-wells already. The whole New York Times index, back to 1851 is online [at Proquest]. To get the whole article you have to pay, but you do get a summary for nothing. I think editing was rather crude at the time – if the article was too long for the space available they simply cut the end off. The title of the paper was the Cincinnati Commercial.